A brake rivet or clutch rivet has a 150 degree countersunk head with a cylindrical body and a semi-tubular hole with a depth approximately equal to the rivets diameter per ASME B18.7 1972. Brake rivets are used as a heavy duty alternative to bonding in high load applications such-as truck brakes so that the lining maintains its position relative to the brake share during useful life of the lining. Another benefit of rivets versus bonding alternatives is that the brake shoe may be rebuilt by removing the rivets/sacrificial friction materials and replacing/re-riveting. The ASME standard presents a variety of rivet lengths to insure that each lining thickness of the brake shoe can be accommodated while maintaining a hole depth that is approximately the same size as the body diameter. The part number of a rivet is standardized with a diameter and length code which identifies the rivet needed for various lining thicknesses. Brake rivets have specific requirements which are intended to minimize or eliminate the possibility of cracking during installation. Critical features are the material, hole diameter, hole depth, and the friction reducing coating to improve material flow as the rivet is set in place. 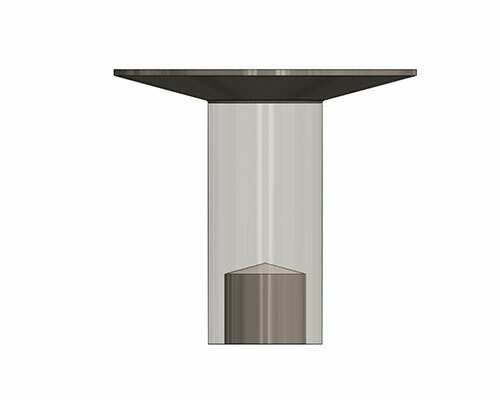 In addition, the anvil and roll form design has been refined specifically for use in brake rivets to insure the proper roll-set of the rivet. 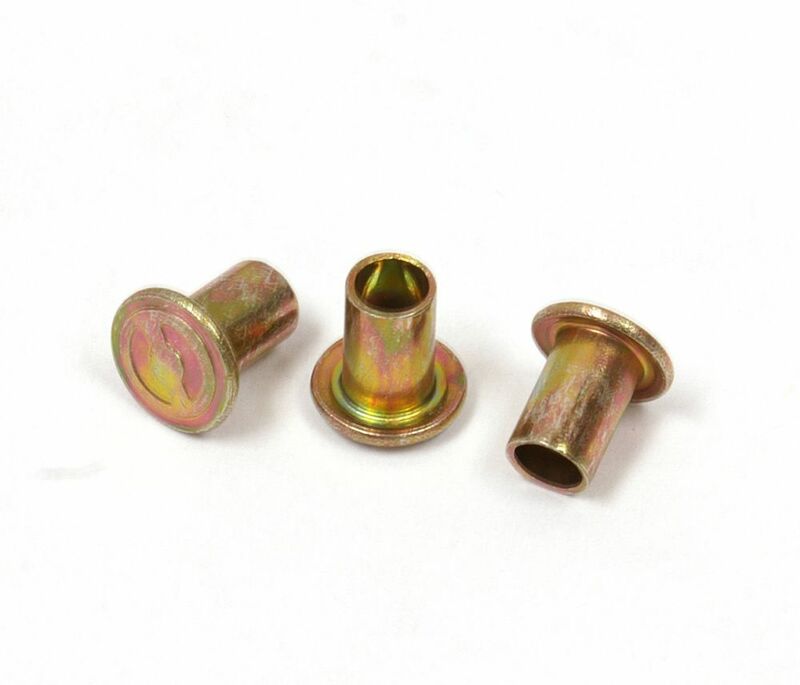 Brake rivets are commonly produced from C1008/C1010 steel with a zinc yellow plating of approximately .0003 thickness. When the semi-tubular rivet is installed, the rivet is pushed through a hole in the lining and then through the backing plate of the brake shoe. Pressure is applied to the rivet head to keep it tight in the shoe assembly while an installation anvil strikes the exposed tubular end of the rivet, making the walls of the tube roll outwardly and toward the head of the rivet. This shortens the body of the rivet and creates a clamping force between the lining and the shoe. If the inner end, or base, of the hole in the rivet extends beyond the inner surface of the backing plate when the rolling begins, the sidewall of the hole will stop rolling before a clamp force has been created, resulting in loose brake shoe linings. To overcome this concern, a taper hole design is available in order to minimize the stress on the tubular sidewall which allows for outward rolled expansion with less stress on the rivets raw material. This allows for a greater clamp load/range and the resulting roll set is less dependent on the rivet-materials ductility to avoid a cracked roll-set condition. In addition to the alternate hole design, specific paraffin or teflon based waxes can specified reduce the friction co-efficient during the riveting process.